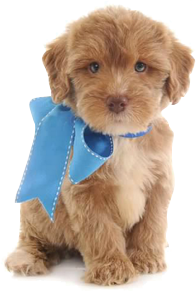 Teddy Bear Goldendoodle puppies were first bred in the 1990s in Australia and North America when golden retrievers were crossed with standard poodle dog breeds. They were an experiment because the goal was to develop dogs that could guide blind individuals with allergies. The Goldendoodle usually has a curly or at least a wavy coat of about two or three inches in length. The hair is longer on the ears, body and tail making them adorable pets. The legs may be feathered and the hair on their head can be a bit shorter and straighter. The color of a goldendoodle's coat can be very different. It can be champagne, golden, red, apricot, copper, black, ultra cream and a mix of these colors. The color that is most common is champagne. The feather surface can be a bit lighter and as the dog gets older the coat gets lighter. This dog doesn’t shed a lot of hair, but it still depends on the coat type. Even though it is considered a low-shedder or non-shedder it needs to be groomed to keep the quality of the coat. The coat can be clipped in order to make maintenance easier, however, if not it must be brushed every week. They don't need to be bathed so often as their coat contains necessary oils and moisture by itself. As it was already mentioned, the coat of the puppy changes when it matures. It grows longer and becomes full and very plush. The puppies that don’t have curl on the back or forehead at birth or don’t show any signs of “crimping” are straight or loose wavy coated puppies. Otherwise the puppies are curly coats. Golden doodles are friendly and connect to everyone and anyone. They are an excellent family dog. They are very outgoing and are excellent companion for walks with disabled people. They have some excellent personality traits because they are smart, affectionate, gentle, trustworthy, trainable and cheerful. They always want to please the people around them. They get along with other pets as well. Also, they require affection, attention and time in order to be happy. If they are alone for a long period of time they can change their behavior. Golden doodles have a lot of energy and they are very active. They can be included in any type of physical activity such as hide-and-seek, agility, flyball, fetch-and-retrieve and other sports. This is not a hunting dog even though its ancestors tend to hunting. They like to take long walks each day and to swim in given occasions. This things will keep the dog physically and mentally fit. These dogs respond well to training and put effort to it when they have the proper motivation. The harsh training with punishment doesn’t work on them. It is best to start train the dog while it’s still young and continue later on. A well-trained Golden doodle can be a true treasure. The Golden doodle’s size can be standard, medium and small. It is determined by the height. The small Golden doodle’s height is between 12 and 15” and the weight between 18 and 30 pounds. The medium Golden doodle’s height is between 16 and 19” and the weight between 30 and 50 pounds. The standard Golden doodle’s height is between 19 and 23” for females and between 20 and 25” for males. The weight is between 50 and 85 pounds. The average life of a Golden doodle is up to 15 years. A dog that is taken care of and is on a good diet with appropriate exercise can live even longer. They have a unique look usually with curly coat. They are extremely friendly, intelligent, brave and extraordinary cute. They will make you love them in a matter of seconds.